An important part of the mission of Christ Church is to create an environment in which we can grow in relationship with God, the world, and each other. We are committed to nurturing children’s innate spirituality and love of neighbor through our Children’s Chapel and our Christian Formation programs for children age 3 through high school. During the school year, Children’s Chapel begins (for age 3 through 4th grade) at 10:00 am Sundays. Education programs for all grade levels meet after the 10:00 service, from 11:15-12:00. Classes meet during the adult forum so the whole family can share the joys and challenges of Christian formation! 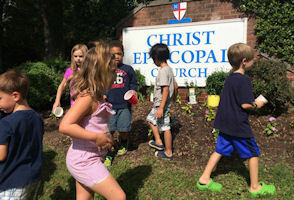 During the Summer, Children’s Chapel continues at the start of the 10:00 Sunday service, but no classes follow the service. 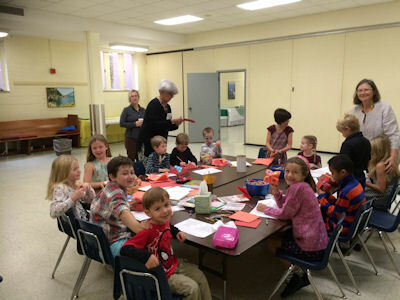 All age groups learn about the Bible and Christian tradition with creative activities. All groups also learn about and participate in worship, prayer, and service projects to help make these practices a way of life. Children’s Chapel is an opportunity for Christ Church’s younger crowd to worship and wonder in fun, age-appropriate ways. Services led by Children’s Minister Ann Enkiri and a team of of awesome volunteer chaplains include Bible stories in child-friendly wording, music, and prayer. Parents are welcome to come to Children’s Chapel or to stay in the 10:00 service. Chaplain Ministry: The Chaplain Ministry, although small, is very active. 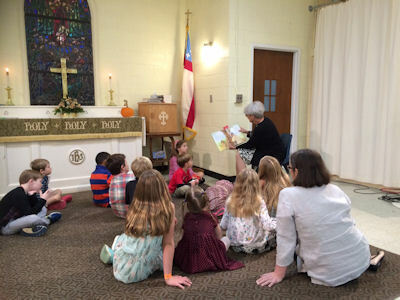 Each Sunday the volunteer chaplains share their gifts with the children during Chapel time. If you are interested in being a Chaplain, please contact Ann Enkiri (email). It only takes 15 minutes one Sunday a month. Registration is required for each of these programs: Sunday School PK3-Grade4; Children’s Chapel; Nursery. The Nursery: Sunday mornings from 9:50 to 12:15. Location: Lower level between the Education Wing and the Undercroft. Staffed by Ms Mary Mutisya. Children’s Chapel: Sunday mornings from 9:50 until announcements during the 10:00 am service. Children’s Chapel is for children PreK3 through Grade 4. Parents may stay with their children or attend the 10:00 am service. Visiting children and drop-ins are always welcome. Children may arrive as early as 9:50 am for a gathering activity. Chapel worship celebrates the Liturgy of the Word, with song, movement, Gospel story, and prayer. The children are led up to the sanctuary during the Announcements and, after participating in taking up the gifts at the Offertory, they join their families for Eucharist. Led by Ms. Ann Enkiri with Children’s Music Ministry members. Volunteers – youth and adult – are needed to lead songs and to serve as chaplains. Please contact Ann Enkiri (email) for information and to volunteer. Sunday School: Sunday mornings immediately following the 10 am service until 11:45. At the end of the 10:00 am service, children PreK3 – Grade 5, parents, and teachers follow the acolyte carrying the first cross. leaving the sanctuary ahead of the choir and congregation. Ann Enkiri, Children’s Ministry Coordinator, meets the children and leads them downstairs to the Elementary and Godly Play classrooms (past the nursery, turn left). 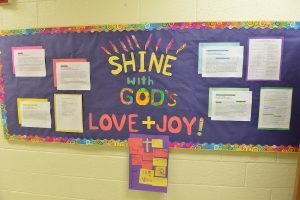 Location: Elementary and Godly Play classrooms, lower level, Education Wing. Preschool, Kindergarten, and Grade 1 children participate in the acclaimed Godly Play program, which provides children with wooden figures and activities for telling Bible stories. This imaginative play encourages children to seek and find answers to their faith questions in the Montessori tradition. Grades 2-5 children participate in a program that celebrates children’s varied learning styles. They investigate the same Scriptures heard in the church service, using art, drama, music, games, and other hands-on activities. Both taught by parish volunteers. Teachers and aides are needed. Training, orientation, lesson plans, and classroom materials are provided. Please contact Ann Enkiri (email) for information and to volunteer. Every non-teaching family is expected to co-op in either classroom twice. Each Summer, a week-long Vacation Bible School has been offered, with children exploring Old and New Testament stories through Godly Play, dramatic story telling and fun activities. The recently concluded 2018 Vacation Bible School was a fun-filled week of Bible stories, creative play, friendship and good times offered with two tracks: PreK4-1st Grade and Grade 3-5. Youth from Grade 6-12 served as Senior Leaders, assisting the adult volunteers with all of the daily activities. For 2019, Vacation Bible School is July 8 – 12, from 9:00 am to 4:00 pm. For more information, email Children’s Minister Ann Enkiri at sundayschool@ccpk.org. For additional information about our children’s ministries, contact Ann Enkiri (email). 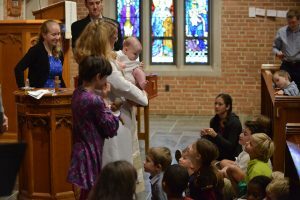 Instruction is always available for children over the age of three who are to be baptized, and for all children before they receive Communion for the first time. Christ Church Parish Kensington (CCPK) seeks to ensure that our children and youth are kept safe during all church sponsored events. In order to do so, the Vestry of CCPK has approved The CCPK Guidelines for Children and Youth Volunteers. Please click here for a copy of the Guidelines. All volunteers regularly assisting with our children and youth ministries are required to adhere to these guidelines. If you have any questions or concerns, please email the Youth Minister (email) or the office (email) or call the church office at (301) 492-4673.